TBILISI, DFWatch–Georgia’s main opposition party is hoping that a popular news anchor will bring it back to power in the politically important position of Tbilisi mayor. The nomination of Zaal Udumashvili, host of the main news program on Georgia’s largest TV channel Rustavi 2, to represent the United National Movement (UNM) will add a new dimension to the elections this fall. Launching his campaign on Monday, the TV personality vowed to challenge virtually all problems facing Tbilisians, including ugly construction projects, environmental issues and ‘corruption and nepotism’ in the city hall. 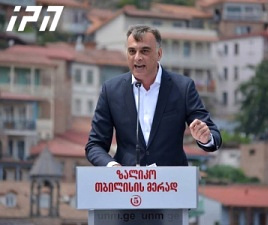 “Tbilisians are very angry today because the capital has never been so abandoned as it is today […] I’m the candidate of angry Tbilisians and I want to make it a city of happy people,” Udumashvili said at a theatrical show held against the background of Old Tbilisi. UNM’s former nominee, Nika Melia, was nominated as a candidate for chair of Tbilisi city council, the Sakrebulo, and announced his departure as a member of parliament in order to participate in that race. Incumbent Mayor Davit Narmania has seen his popularity drop as many see him as unable to solve Tbilisi’s problems, even among the ruling GD party, which replaced him with the vice prime minister, Kakha Kaladze, as their candidate in the election.